Alfredo Graciano was a member of the inaugural class of Project SEARCH. He gained valuable work skills while completing program supported internships in the Howard County Department of Public Works, Howard County Bureau of Utilities and the Howard County Circuit Court. 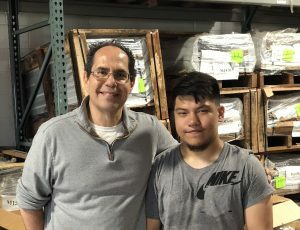 His smile proved to be a bright light during each of his rotations and helped him discover that work in a shop environment was where he felt most comfortable and the environment where he later wanted to work. The Courtesy Clerk position at Jiffy Lube proved to be a perfect match for Alfredo’s interests and skills. Alfredo works at Jiffy Lube Monday-Friday. He would be happy to greet you, open your car doors and perhaps check your car’s tire pressure when you go in for your next oil change at Jiffy Lube in Clarksville! Olmer was in the Project SEARCH Howard class of 2016. He was hired by Mobern lighting in the spring of that year and has been working 5 days a week for over 2 years now! Olmer helps to assemble industrial lighting frames and has developed his skills to where he can work in several areas of the company’s production line. Bob Claire, General Manager for Mobern, was instrumental in hiring Olmer and has been one of his strongest supporters – often challenging Olmer to increase his skills and offering Olmer the same opportunities for advancement as all employees. Congratulations Olmer for a job well done and to Bob Claire and Mobern Lighting for believing in a diverse and inclusive workforce!